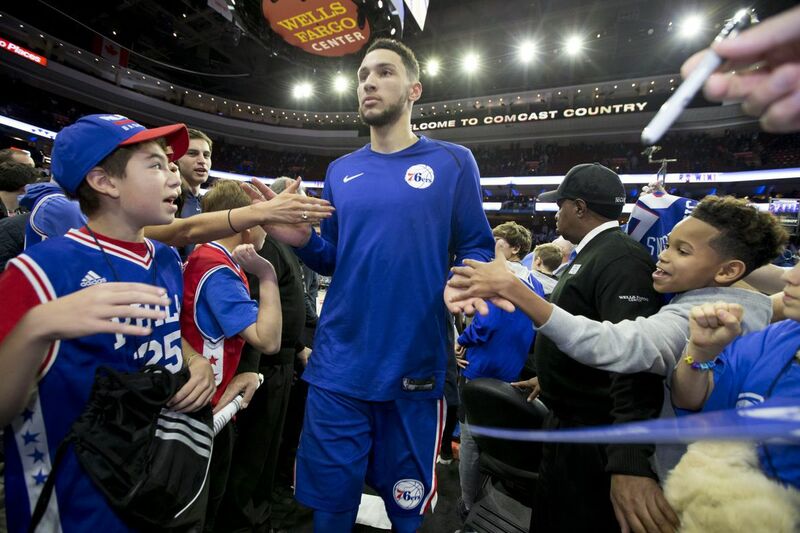 Ben Simmons of the Sixers makes his way through the crowd after their 101-81 victory over the Trailblazers at the Wells Fargo Center on Nov. 22, 2017. The Flyers are 9-0-1 since Brandon Graham stripped-sacked Tom Brady. The Sixers had gone 7-0 since the Philly Special became a tattoo template before the Washington Wizards snapped their winning streak Sunday night. Both teams lost on Feb. 3. Both teams watched the Eagles beat the Patriots in Super Bowl LII on Feb. 4. They watched unheralded quarterback Nick Foles call for the "Philly Special," a fourth-down play on which he caught a touchdown pass. They watched center Jason Kelce, dressed like a mad, giant jester and fueled by free Bud Light (Dilly Dilly! ), recount the Eagles' journey at the end of the victory parade four days later on the steps of the Art Museum. Both teams were inspired to be the next champion, and they've played like it. "I think guys get a little jealous," said Sixers guard Ben Simmons. "We're happy for them, but at the same time, we want that feeling of winning a championship." The Eagles' winning makes the Sixers and Flyers play harder? "That plays a part in it," Simmons insisted. "We know what it takes, just seeing those guys play and give everything they've got, every game. That definitely plays a part of it." "Teams are rolling right now. The Eagles did their part," said Flyers defenseman Shayne Gostisbehere. "Seeing how much fun they had winning, and the parade, and all that, puts a little pep in our step. Hopefully, we can keep it going." Both teams have been hot at the same time in the past, but in those instances both teams were expected to be good. The Sixers were trying for their eighth straight win Sunday night. The last time they won eight straight was during a nine-game streak Feb. 12-March 2, 2003, which helped them to a fifth straight playoff appearance. The Flyers went 6-2-2 in that span, but they were in the midst of their ninth straight run to the playoffs. After being named player of the game, Joel Embiid of the Sixers throws an autographed basketball into the crowd. The Sixers defeated the Wizards 115-102 at the Wells Fargo Center on Feb. 6, 2018. "Maybe the Eagles' winning helps. In the city there's an unbelievable energy," Sixers forward Dario Saric told reporters soon after the Eagles beat the Patriots. "When I'm walking around my apartment [building] or go into a shop, you can feel that the atmosphere is different. Maybe it's because of that." These are fascinating admissions because players usually will only admit to looking inside themselves for motivation. Then again, when an entire region is energized by the biggest win in the biggest sport in the country, it is an unusual moment. It is a religious experience. The Eagles have invigorated everyone and everything. Maybe it's mojo. Maybe it's juju. It's certainly not coincidence. "It gets you hyped," said Flyers wing Michael Raffl. "Makes makes you see what is possible. It makes you dream." Those sorts of dreams include gaudy championship rings. Those sorts of dreams seemed silly last fall. Neither the Flyers not the Sixers made the playoffs last season. In fact, the Sixers haven't made the playoffs since 2012, which was the last time either won a playoff series since 2012. Now, both Claude Giroux and Joel Embiid will get MVP votes. Both the Flyers' Dave Hakstol and the Sixers' Brett Brown should get coach of the year consideration. Like the Eagles, who lost seven of their top 26 players to injury for long stretches, both winter teams have had issues. The Flyers lost their No. 1 goalie, Brian Elliott, eight games ago. They lost his backup, Michael Neuvirth, four games later, against the Rangers. After that game they also lost winger Wayne Simmonds, their best player over the past two seasons. Flyers’ Nolan Patrick celebrates what would be the game winning power play goal against the Blue Jackets with teammates Sean Couturier, Claude Giroux and Jakub Voracek during the third period at the Wells Fargo Center in Philadelphia, Thursday, February 22, 2018. Flyers beat the Blue Jackets 2-1. They're 4-0 and have allowed seven goals since Neuvirth left. The Sixers came back from a 24-point deficit and beat the Heat on Feb. 14, and did it without all-star starter Joel Embiid. They had been 2-8 without Embiid this season. They've also stopped blowing late leads. "I think the Eagles might have sprinkled some magic dust on us or something," Goshisbehere. "It's pretty cool." Things weren't cool during the Flyers' 10-game winless streak from Nov. 11-Dec. 2. Things weren't cool when the Sixers lost nine of 10 from Dec. 4-23. Teams that lose big like that early in the year usually falter in the dregs of their seasons. These are the dregs, but both teams are energized … and not vicariously. They got into the Eagles' mix. Embiid and Justin Anderson attended the Super Bowl. The Flyers got back from a game in Washington in time to attend the last three quarters of the NFC Championship Game in Philadelphia on Jan. 21. The Flyers threw themselves and their wives a Super Bowl party in a private room at Vesper, a nightclub in Philadelphia. Afterward, some of the players took to the streets with the fans. "It was sick to be a part of it," Raffl said. "I live right downtown. I was celebrating with all the people right on Broad Street. It was amazing. I was out there for a little bit. It was awesome." He might have bumped into Simmons, who was wearing his Alshon Jeffery jersey. "I watched the game in my living room. I live near City Hall. After the game, I looked out from my balcony and saw people screaming. Running. Going crazy," Simmons said. "So I went out on the streets for a little bit, but it got too hectic, so I went back inside." There, he reflected on what winning it all means in Philadelphia. "You see how happy they are. You see how excited the city is," Simmons said. "We want that same thing for the city."